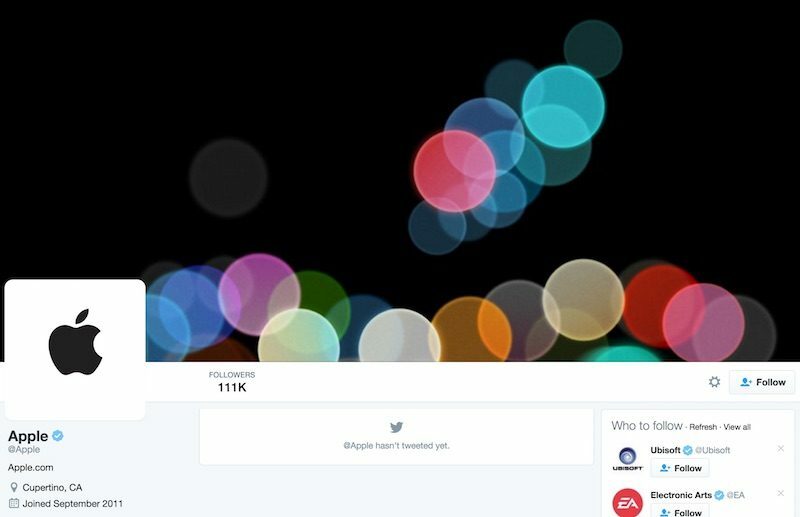 Created five years ago in September of 2011, Apple's official twitter account, @Apple, has begun stirring today. The company updated the page with a new logo -- a classic black Apple image on a white background -- and the same teaser art for next week's September 7 event that was included on invites earlier this week. Although Apple appears to be preparing a new section of its social media presence, the account has yet to tweet anything to its more than 110,000 followers. With the timing of the reactivation, and the similar art, it seems likely that Apple will begin using the account to share news and updates from its event in the Bill Graham Civic Auditorium in San Francisco, California. Apple hasn't been completely averse to social media, since over the past few years the company has created Twitter accounts for iBooks, Apple Music, iTunes, and just this year began bolstering its presence on Twitter with Apple Support and Apple News. Apple was recently rumored to be working on a social media app of its own for launch in 2017, with similarities tying its video-heavy features more to Facebook and Snapchat than to Twitter. Update: Apple’s Twitter account has shared a promoted tweet reminding users about next week’s event. Users can retweet the status to get an event reminder. Apple is waiting for Twitter to become popular before they start using it. Either that or they just found their password in Steve's desk drawer. I'm guessing Apple is going to have a lot of negative criticism afterwards trying to get by a third year with that 6 series design that sports a huge downgrade in losing the headphone jack. There isn't enough tweets to spin that into something. Good god. Get over the freaking design already or don't buy it. Its that simple. I've never been so excited for an Apple event. Every hour is dragging atm. I'm ready to be wowed, let's go!!! Man, so many Negative Nancy's on MacRumors this morning. Y'all need to get your coffee or something. Apple has had a twitter account? And someone noticed a logo change after 5 years? Agreed. The 6/6s design is a good one, no need to bring out a new design with a different set of flaws to deal with in the S version, especially when the 2017 edition is going to be the 10th Anniversary edition or whatever. It'll have a new processor, more ram (in the Plus), waterproofing (most likely considering the 6S) and a new camera. To me, anything else is a cherry with sprinkles on top. The only time I use headphones is for working out, and those are Bluetooth already because who the heck wants to lift/run with cords in the way, so the loss of the jack doesn't bother me. I feel like people on these tech blogs forget that we are not the typical consumers and that our disappointments with new tech are not necessarily the general public's disappointments. If anything the general public might like the fact that one's phone doesn't look outdated after two years, and I'm sure there are probably a number of 5S owners who haven't updated yet. Really!? Why? The rumours all suggest it will be one of the least exciting ever. iPhone not a significant update, apple watch not a significant update, unlikely to be macs mentioned. Unless of course you are into lots of time being taken up talking about fantastic beats headphones using a lightning connector / wireless. I'll be thrilled to be wrong though. It's at this time i really wish there was a clapping emoji. I totally agree with you, i cant believe how superficial people are being over a design, something they wont be looking at that much anyway, since most the time is spent looking at the FRONT of the phone. I don't even think it looks that bad. It hasn't even been announced yet. Exactly, i think the dual camera alone will be worth the upgrade.